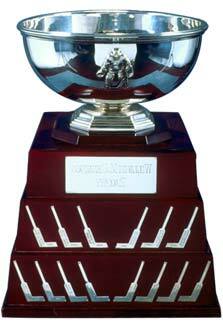 This trophy was presented in 1981-82 by the NHL Board of Governors to honour the late William M. Jennings, longtime governor and president of the New York Rangers and one of the key builders of hockey in the U.S. It is awarded annually to the goalkeeper(s) having played a minimum of 25 games for the team with the fewest goals scored against. 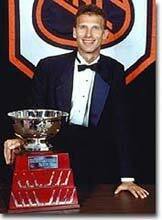 Leading winners: Martin Brodeur, Patrick Roy (5), Ed Belfour (4), Brian Hayward (3). The inaugural winners of the William M. Jennings Trophy was the Montreal Canadiens' goaltending tandem of Denis Herron and Rick Wamsley.